The grouting between your ceramic tiles will often become discoloured with age. You may also get black mildew forming in damp areas like bathrooms. To get them looking good again you can try a few different things. Re grouting them completely wil get them looking good as new however re grouting will require quite some time and effort. Before attempting that you may want to consider several quicker options. The first option would be to try scrubbing them with bleach and hard tooth brush. Can be affective but is still quite laborious. Alternatively you can try a steam cleaner. Several diy steamers come with attachments with fine nozzles suitable for this. NB. If you fancy changing the colour of the tile completely Ronseal also make special tile paint. Simply paint over the whole lot !! To properly re-grout tiles you first need to scrape out the old grout. I have tried various tools for this. The one I have had great success with is The Vitrex grout rake. 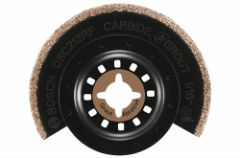 The blades for these are made with an abrasive material. You simply rub the rake firmly down the lines of grout and scrape it out. And the blades are replaceable. You'll need to rake out at least 2 mm. of grout so that the new stuff will get a good firm attachment. 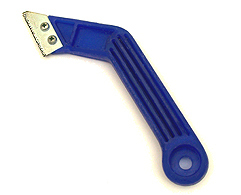 If you have alot of grout to remove it might be worth buying an electric grout removing tool. There are several on the market. I prefer to use an ocillating tool with a tile bit attachment. Next apply the grout with a rubber grout float. I always use a water proof grout. You can buy it as a powder you mix with water or ready to use in a tub. Force the grout right into the gaps. You'll find that you get grout on the tiles themselves. Use the float to scrape as much off as you can as soon as possible. Don't let it dry. 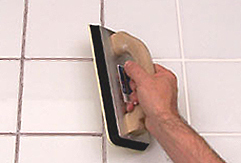 Then use a damp sponge to gently remove any remaining grout from the tile surface. Lastly use you finger or a grout finisher to run down the grout lines to get a nice smooth finish. When the grout has dried thoroughly polish off any grout residue which will be obvious if a tile look slightly dull.